Amidst towers of trash and mountains of stolen trinkets, a horde of kobolds engages in an endless exchange of fists and baubles. Forgotten among this ocean of junk lies the Mabinogi branch, an artifact that restores life to a dying soul. However, overcoming the bloodthirsty swarm is only the beginning; a party of deep elves stands ready to hunt down any who attempt to reclaim the branch. Find the treasure among the trash, and defeat your enemies to seize power over life itself! Bring legendary heroes and infamous monsters to your Descent: Journeys in the Dark Second Edition game with the Bonds of the Wild hero and monster collection. Explore the unique strengths and abilities of these monsters and heroes by playing the included quests individually or through the use of Rumour cards. 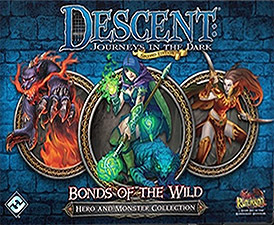 With 4 heroes, 3 monster groups, and 2 new quests, the Bonds of the Wild hero and monster collection gives fresh options to your Descent: Journeys in the Dark game!